This coming Sunday, 29th of July, is celebrated as the Day of Good Fortune, also called the Day of the Seven Lucky Gods, in Japan. The Seven Lucky Gods (including the goddess Benzaiten, the patron of all artistic endeavours) are known as “Shichi-Fukujin”: shichi means seven, i.e. the seventh month; and fuku means good luck, but it is also one of the ways of pronouncing the number 27 when it is written in Japanese. On this day it is a tradition to eat “Good Fortune Pickles” (fukujinzuke), which are made from seven different vegetables, each one representing one of the lucky gods and an aspect of good fortune. You can find an online version of the recipe here. 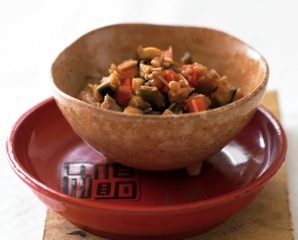 However, you don’t really have to go to all the trouble of making a traditional Japanese pickle to celebrate the coming Day of Good Fortune. Instead, why not create your own special meal using seven different ingredients. As you select the ingredients, try to choose a variety of colours and textures and find the freshest produce that you can. With each of your seven ingredients, as you chop and prepare them for your meal, think of one special blessing in your life that can be symbolised by each of them. This can be someone who is special in your life, who brings you joy, who you feel gratitude to; or it can be elements of nature such as sunshine, rain, trees and so on that make you feel connected to the earth; or things about your own life that you are grateful for such as your health or having a warm home to live in. In this way, when you eat your meal you will be bringing your awareness to the blessings you have in your life and feel those blessings nurturing your body and your heart as well. This is a wonderful meditation that satisfies our physical and spiritual hunger on many levels. Ideally of course this meditation would be a wonderful spiritual practice that we can bring into our lives every day, with every meal. This entry was posted in Cooking, Spirituality, Vegan, Vegetarian and tagged Elizabeth Andoh, fukujinzuke. Bookmark the permalink.